How a House is Like a Tank of Water | Russell King, M.E. Happy 2014, everyone. 2013 was a good year for me. It certainly did not go the direction I would have expected with the California Energy Commission work lasting all year, but it was a blessing and I’m very grateful. I realized that I only posted two blogs last year. Even though those two blogs generated a ton of feedback and even a little controversy, I resolve to do much better this year. Great news! 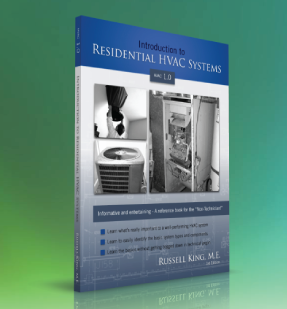 SMUD has generously offered to sponsor my “HVAC 1.0 – Introduction to Residential HVAC Systems” for FREE! Obviously, it is based on my book of the same name. You even get a free copy of the book (a $29.99 value). Here is a link to sign up: https://usage.smud.org/etcstudent/ClassDescription.aspx?Id=895 Right now it is to be offered on March 6 at their headquarters. If the demand is high and the response good, they could very well offer it again. If you can’t make it on March 6, be sure to tell them that you’d love to see it offered on a different date. I’ve been experimenting with making this class an on-line class. I’ve taken some of the power point slides and some audio files of me speaking and created a short movie. We all hate the way our recorded voices sound and I’m no exception. I speak much more slowly and sound a lot more like Mr. Rogers than I do when I teach live. As an experiment, I started with Appendix A. This is the “Tank of Water Analogy” that I’ve been using for years and getting excellent feed back. It’s amazing how a simple analogy can really help explain something that’s much less intuitive. It’s definitely the most basic part of the book. Other sections are far more technical. This was a good section to experiment with. There are a lot of different ways to do on line training. For me, the most effective is the one that you can easily pause, rewind, replay. My plan is to take a class that can easily go 8 hours live and condense it down into about 5-6 hours worth of videos, none of which are more than 20 minutes long (hopefully). Very good correlation between “the House” and the Tank. Should be easy to follow for all homeowners. Good analogy and explanation..,, and, no you don’t sound like Mr. Rodgers – the sound of the recording is pretty close to your speaking voice which is a good sound. You might try explaining the concepts as related to a house as you go along rather than waiting to the end of the video. those who have some understanding or training already are going to understand the analogies right off but the novice may wonder what you are talking about. Maybe a side by side graphic of the water tank and a simple frame house. Are we assuming that the viewer already knows the basic thermal dynamic principles of building science? Good stuff, I look forward the next installment. I will try to get the SMUD class. Great video Russ. I’ve started using this analogy when doing home assessment because it really does help homeowners wrap their mind around the concept of energy loss and how we try to “fix” the problem with larger HVAC equipment. Thanks for making this! Awesome. Thanks, Aaron. I’m glad it works for you. I have never heard it explained like that. Such a simple concept and easy to explain. I am going to use it to help get across the importance of the entire house as a system and all parts to be be addressed for that system to work efficiently. So many people only want to focus on the furnace or AC instead of the systme as a whole.